iPhone battery cases normally add considerable unwanted thickness and extra weight to your Apple smartphone. But one company has endeavoured to change this and created what they are calling the worlds thinnest iPhone battery case in the form of ThinCharge. 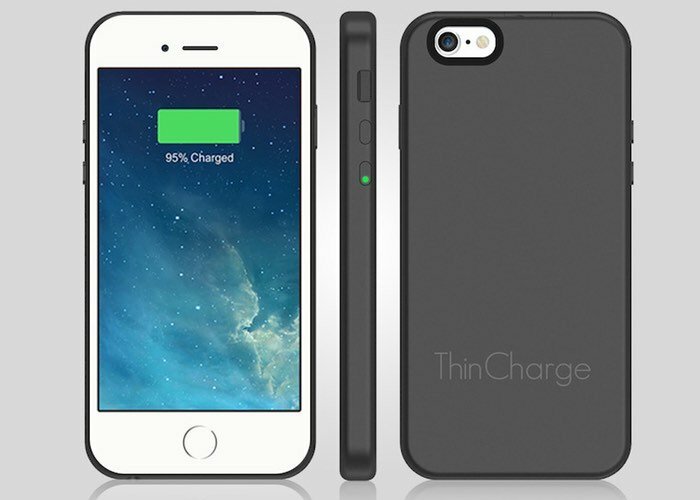 ThinCharge has been designed to be the lightest and thinnest battery charging case ever made for the iPhone. Providing a 200 percent battery life when compared to the iPhone 6 battery on its own, adding an extra 2600mAh of juice to your iPhone. Watch the video below to learn more about the ThinCharge iPhone case’s design and functions from its developers. The iPhone 6 is a beautiful piece of hardware. It’s also the lightest and thinnest ever made. At only half an inch thin and less than 3 ounces, you won’t even notice ThinCharge is there. Charge your phone anytime, anywhere with the press of a button. It’s so light and thin, you won’t even notice it’s there. Jump over to the Indiegogo website to make a pledge from $59 to be one of the very first to own one. Have a look at our top 10 tips on how you can improve iPhone battery life.